We are in the era of affordable yet capable smartphones, devices that provide a satisfactory experience at reasonable price tag. 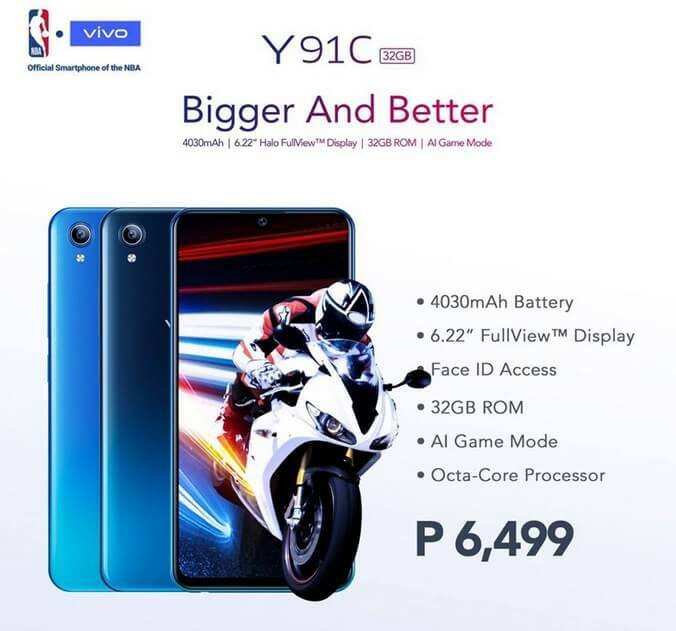 One of the handsets that we can consider in this segment is Vivo's newly announced budget-friendly offering, the Vivo Y91C. The Vivo Y91C sports a 6.22-inch Halo FullView Display with HD+ resolution and about 88.6% screen-to-body ratio. On the inside, it is powered by octa core MediaTek MT6762 processor, better known as Helio P22, paired with 2GB of RAM and 32GB of expandable storage. Camera wise, there's a 13MP f/2.2 mounted on its back with LED flash and a 5MP f/1.8 selfie snapper. The other notable specs are dual SIM with LTE connectivity, AI Game Mode, the huge 4030mAh battery, Face ID Access, and runs on FunTouch OS 4.5 based on Android 8.1 Oreo. It is now available nationwide for a suggested retail price tag of only Php6,499!